The two types of garage door parts which are under the highest amount of tension on a regular basis are the cables and springs. They are also the components that do the hardest work as they are in charge of lifting and lowering the door, and must be able to support and counterbalance the weight of the panels. That is why if these components break, the entire door system will probably malfunction. It's often better to have these units replaced before they snap, in order to avoid the inconvenience and potential danger involved in such a scenario. 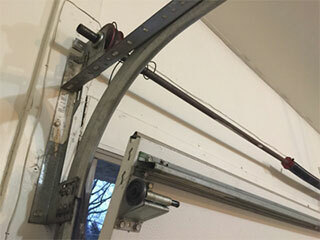 If the garage door gets stuck, one of the cables probably broke. In this situation, immediate replacement is essential. If you try to run the automatic opener, as usual, the door may go off track. This will most certainly result in the track bending or breaking, at which point the repair or replacement of that hardware part will also be required. You wouldn’t want to get into deeper trouble just because you didn’t react quickly to the initial problem, so timely cable replacement is always advised. Broken cable replacement involves removing the two pieces of the damaged component and installing a new one of the exact same size and thickness. Should the other cable be replaced too? Very often, when one of these units breaks it is because of imperfections of the drum, which it is attached to. This is what causes faster fraying. In this case, there is usually no need to replace the second unit, provided that its condition is still optimal. However, if the second cable is greatly frayed and/or has noticeable cuts, it is best for it to be replaced along with the broken one. In general, if you notice any signs of damage, these components should be replaced before they break. Most modern springs are made to last for at least four to five years before breaking, and even twice that long with the right maintenance routine. One thing to keep in mind is that there aren't always signs that these units are about to snap so replacing them preemptively can be difficult to do. When a spring breaks, it must be replaced right away. Odds are you probably won't be able to open the door at all after this happens. Even if you can see tiny fractures developing and want to prevent a breakdown, you must never try and replace these units by yourself. The tension they are loaded with makes them incredibly dangerous, and you should have our experts perform this task instead. The ideal replacement spring has a long useful life, preferably over 10,000 cycles and is made from strong galvanized steel. Keep in mind that torsion springs require lubrication maintenance to stay in good condition longer. Given that the temperature drops considerably during the winter out here in Connecticut, it is best to use a lithium-based lubricant, which doesn’t harden. Need some help with your opener? How about your springs, are they holding up? Whatever you need, our professional garage door technicians can help. We are one of the best service providers in the entire state, and we owe our high ranking to our dedicated technicians. We always strive for complete customer satisfaction, and we only use top of the line replacement parts when performing any type of repair work. Use our online system to schedule an appointment today. Thank you for choosing Garage Door Repair New Canaan! One of our experts will be in touch soon. Feel free to browse our website for FAQ, tips and more useful information in the meantime!